This summer I had the joy of leading a team of students in collaborative research to help launch my next book project, The Modern History of Global Food. The book will feature a series of case studies exploring how we can better understand important world historical themes by analyzing foods that moved around the globe. The students worked together for five weeks: gathering sources, building a digital bibliography, taking notes and beginning analysis. Each student researched a different example of these historic global foods. Noah Switalski ’18 explored how the humble potato has changed diets and societies across the globe after its “discovery” by Spanish conquistadors in Peru. Natalie Cook ’18 examined the central role of sugar in the Atlantic slave trade, with a particular focus on the role of slave women on Caribbean sugar plantations. Margaret Dickinson ’17 researched the development of curry as a cultural exchange between British colonizers and many different groups across the Indian subcontinent. Leland Cook ’17 worked on the long history of rice, with a focus on how global food aid has sometimes been a form of neo-colonialism. All together, these four case studies show a history of growing global connectivity from the crossing of the Atlantic into the twenty-first century. Cullin Smith ’17 also worked with us for a few weeks. He helped to shape the overall project by analyzing the existing literature on global food history. 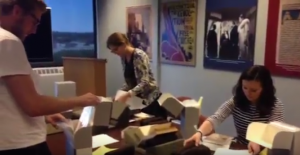 While we worked mostly with secondary sources, we also spent a few days at the Janice Bluestein Longone Culinary Archive at the University of Michigan in Ann Arbor. 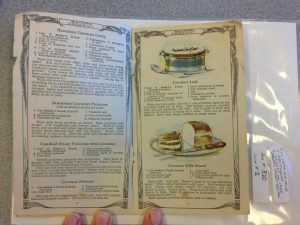 The archive is a rich treasure trove of cookbooks and other food-related documents including promotional materials dating back to the early nineteenth century. This project gave the student an opportunity to work together to explore global history from new angles, and it helped me get going on my next book. This was true student-faculty collaborative research. We are grateful to the Pagenkopf History Research Fund for funding this project. The students will present their work to the Hope and Holland communities this spring, and you’ll be able to read more about this culinary approach to world history when The Modern History of Global Food is published. Previous Previous post: Welcome, First-Year Students!